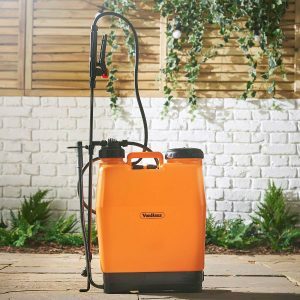 We take a look at our top 3 knapsack sprayers to suit any budget. 2.3 Disadvantages of the Faithfull SPRAY16A Pressure Sprayer. Every homeowner wants a weed-free garden, lawn, fence or driveway. However, weeds are bound to sprout up wherever there are soil and moisture. Are weeds growing all over your yard, fence, or garden? Are bugs ruining your delicate plants? 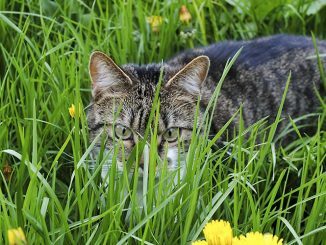 If you are experiencing this, then it is time to spray weed and bug killers using a knapsack sprayer. This excellent tool is designed to help you in spraying herbicides, pesticides, chemicals and fertilizers on your garden, lawn, or fence. 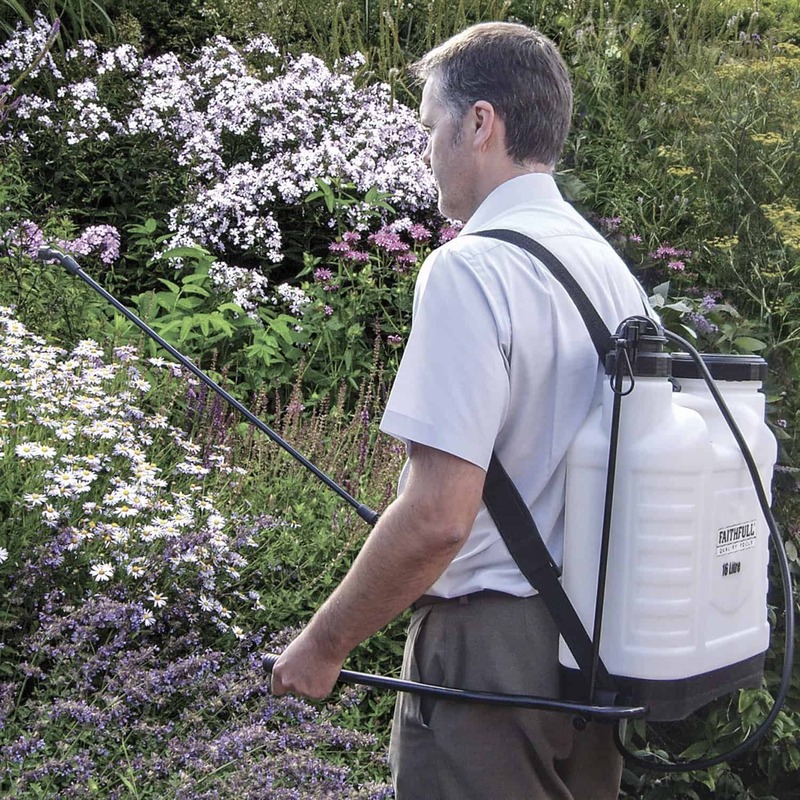 You may be wondering: which is the best knapsack sprayer for your garden? A motorized knapsack sprayer or a piston sprayer? Motorised sprayers are excellent but they are expensive and are ideal for huge farms. For your small to midsize garden, you only require a piston knapsack sprayer. A piston sprayer uses the pressure created by pumping its handle, found on the side or top of the sprayer, to drive the liquid through the hose and lance before spraying. Sprays large spaces faster than hand-held sprayers. Some sprayers have short straps. Not ideal for use under windy conditions. For this review, we selected the best knapsack sprayers. We take an in-depth look at the features of each sprayer. We look at the capacity, weight, lance and hose length, and comfort. Remember, your sprayer is going to be on your back for some time, for this reason we recommend you get a knapsack sprayer with good straps and a trigger lock feature for when you need to spray continuously. If you are looking for a lightweight sprayer that can handle large jobs, then the Faithfull SPRAY16AV is your best bet. This top-rated sprayer is easy to assemble and use. Its design is simple and ergonomic. The tank features a curved design to fit perfectly on your back and prevent back pain. The SPRAY16AV comes with twin padded shoulder straps. These sturdy straps have quick release catches that allow you to adjust the straps and remove the sprayer easily. The lance measures 90cm and the hose measures 140cm; this enables you to spray large vegetable plots without having moving around much. To minimize strain on your hands during use, the manufacturer has fitted the lance with a trigger lock that allows you to use the sprayer continuously. The Faithfull SPRAY16AV features a handle that enables you to pump the chemicals as you walk around your garden or vegetable plot. This pump-as-you-go handle is responsible for creating pressure that pushes the agricultural chemicals out of the tank to the lance. This sprayer also features a large filling mouth that allows you to pour in the mixture without spillage. 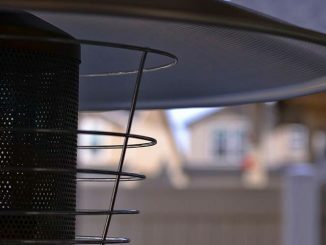 The manufacturer has included a removable filter to prevent garden debris from entering through the filling. The SPRAY16AV comes with multiple spray heads; double sprayer head, fan head pattern, and single sprayer head. The single head is perfect for spraying a specific section in your garden. 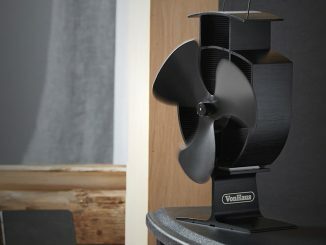 The fan head is ideal for spraying large areas. This product is made of durable, frost-resistant and shatterproof material. This sprayer is fitted with a pressure release valve and comes with a service kit. Very little dripping from its nozzle. Disadvantages of the Faithfull SPRAY16A Pressure Sprayer. Shoulder straps may not clip properly. Heavy when you fill it to capacity. The Oypla Pressure sprayer is backpack sprayer that can safely hold fertilizers, agricultural chemicals, and herbicides. This sprayer features a 12-litre tank which makes it ideal for spraying small gardens and vegetable plots. Its lance measures 50cm while its hose measures 1.5m. This length is perfect since it allows you to spray fences and even high hanging baskets. The lance has a lock trigger feature that allows continuous spraying. Just like the SPRAY16AV, the Oypla sprayer features a lever handle that enables you to pump as you go. This handle works so well that all you need is to pump gently to get a good pressure. 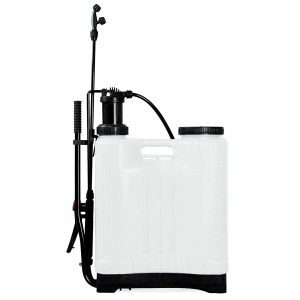 This knapsack sprayer comes with three nozzle tips that vary is spray pattern and flow. You can interchange them depending on your spraying needs. 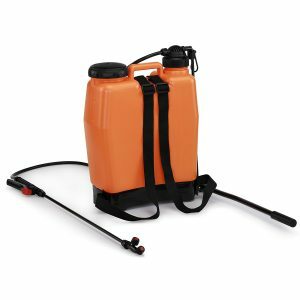 This backpack sprayer has shoulder straps, though some users have complained the straps are too short. Comes with a filter to prevent blockage. Ideal for small vegetable plots. Some users found the assembly instructions were not clear. When purchasing a pressure sprayer, one of the things you have to consider is the size of your garden or fence. The Oylpa knapsack sprayer is ideal small spaces. It is more versatile than a 5L sprayer because it saves you the time you would use refilling your sprayer. It is also lighter compared to a 20L sprayer. 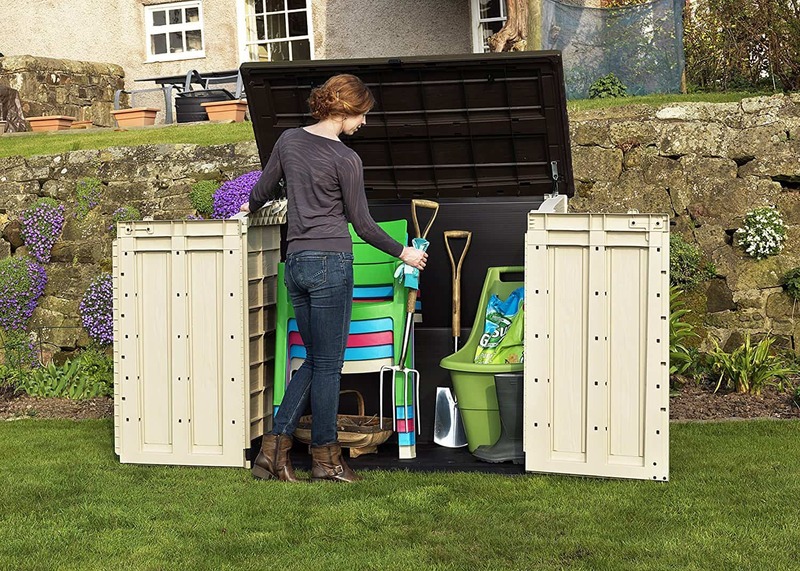 At Garden Shed Reviews, we like the length of the lance and hose that allows you to spray those hard to reach places. Want to spray your garden without worrying about refills? 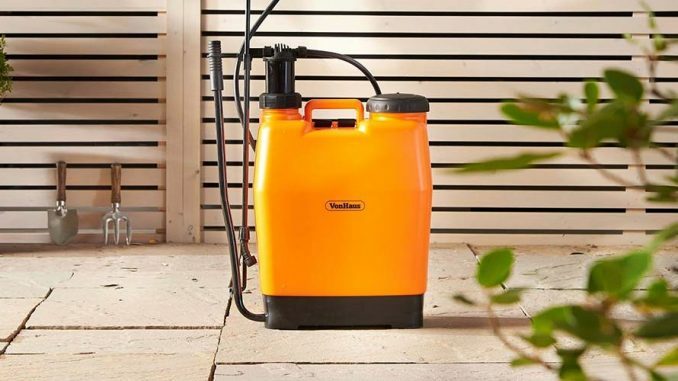 How about you use the VonHaus 16L sprayer? This versatile sprayer comes with a massive capacity 16-litre tank which can hold pesticides, water, herbicides, solvent-free preservative treatments, and cleaning detergents. 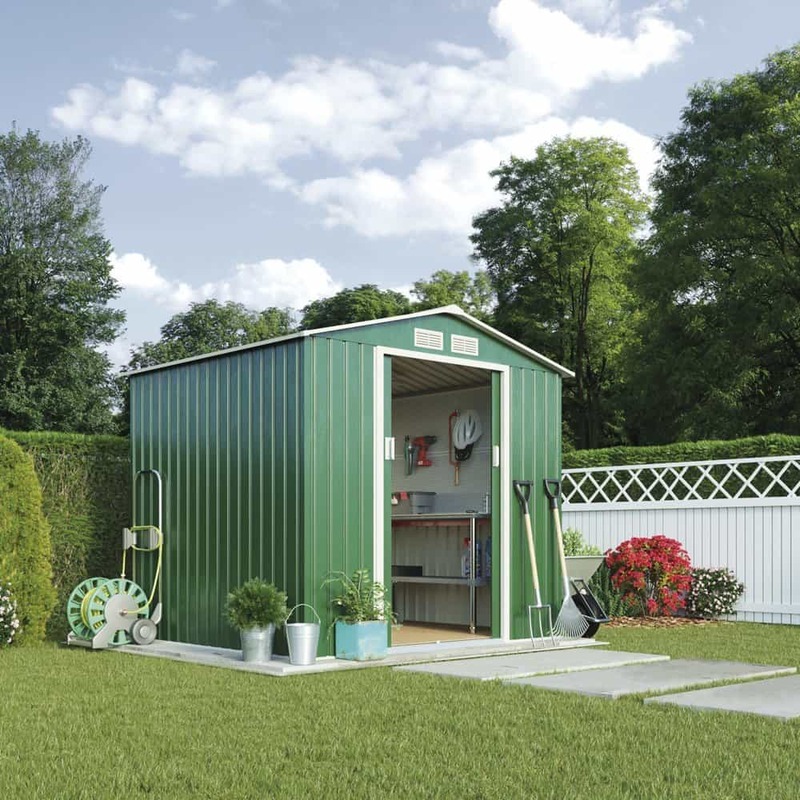 Picking it out from other tools in your shed won’t be a problem. 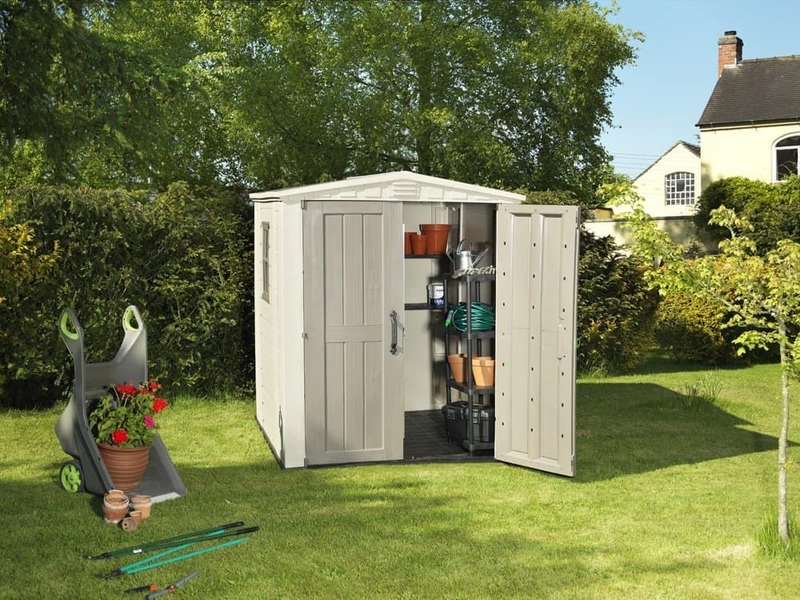 The VonHaus has distinctive orange and black colours which make it stand out. VonHaus pressure sprayer features a simple backpack design that enables it to fit perfectly on your back. This allows you to spray for long hours without hurting your back. The lance and hose are long, making the spraying process smoother. This 16-litre sprayer comes with a funnel-shaped filler, with an on/off trigger, which allows you to pour liquid with precision. Another great feature of the VonHaus sprayer is its adjustable nozzle. This nozzle delivers the liquid in a constant stream or a fine mist. Compared to 20L sprayers, this product is small in size. 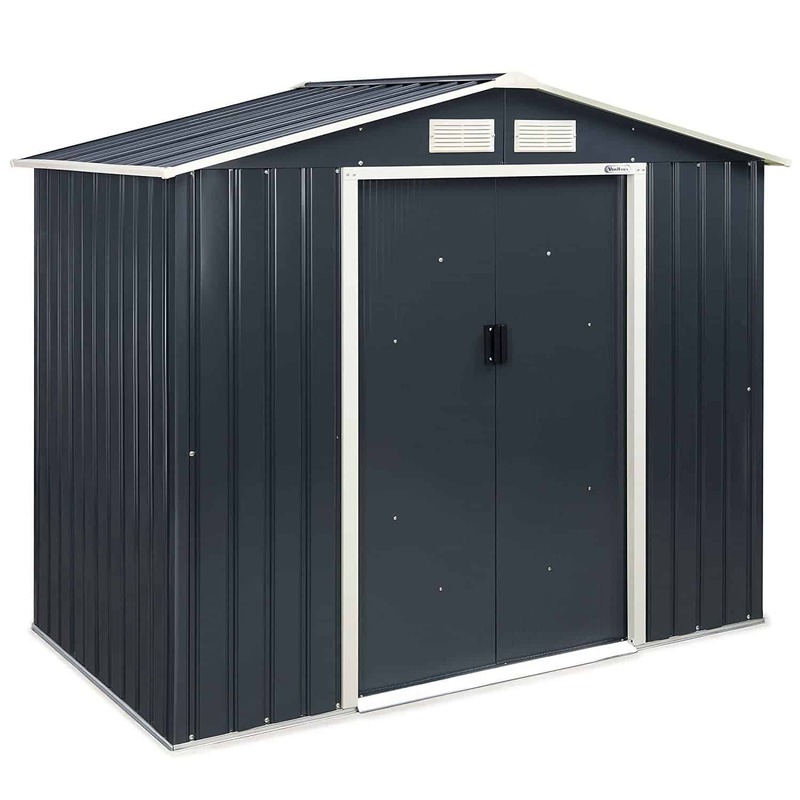 Its compact size allows easy storage in your shed or greenhouse. VonHaus comes with three nozzles to suit all your spraying needs. This robust sprayer also comes with spare nozzles, an additional pump washer, and a two-year warranty. The handle may break if you apply too much force. The VonHaus Pressure sprayer is one of the most affordable knapsack sprayers on the market. This product is a favourite among consumers due to its huge 16L capacity which allows them to clear huge areas without refilling. Users also love the fact that it comes with a warranty, which assures them that if it gets broken within the first two years of purchase, the manufacturer will be sure to replace the sprayer. This sprayer is easy to assemble and use. This review features some of the best knapsack sprayers on the market that will help you spray herbicides, pesticides, water, or other agricultural chemicals on your garden. The Oypla 12L Pressure Sprayer is versatile and is ideal for small spaces. 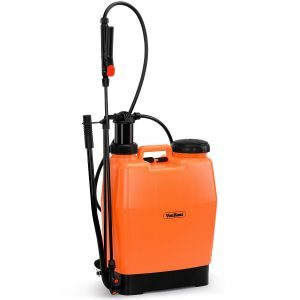 The stunning orange VonHaus 16L Pressure sprayer is easy to use and comes with a large tank. Both these sprayers have great features. However, they can’t compare to the Faithfull SPRAY16AV. Most users love this top-rated sprayer because of its durable frost-resistant and shatterproof construction. This sturdy construction assures them of the longevity of this product. This sprayer has a 16L tank, a long lance and hose with a trigger lock feature that allows continuous spraying. We believe this sprayer is a valuable addition to any gardener’s shed. Bugs and weeds can ruin your perfect garden or fence. Herbicides or pesticides can help you get rid of this menace. One of the best ways to deliver these liquids is through a knapsack sprayer. The review above covers the best knapsack sprayers. These sprayers are affordable, easy to use, and durable. Any of the sprayers above would do an excellent job in helping spray agricultural chemicals on bugs or weeds. We believe you will find a budget sprayer that meets your needs. 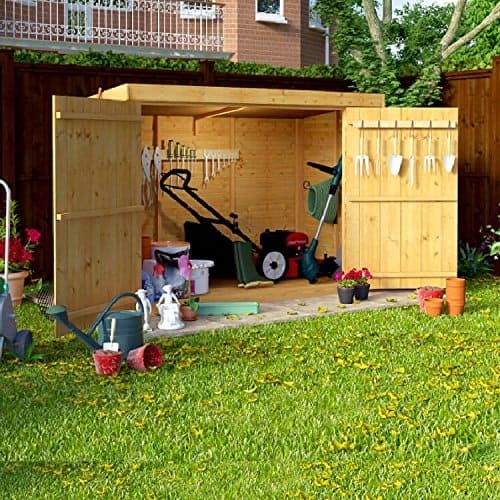 We write independent reviews of garden sheds, furniture and outdoor equipment from all the big manufacturers.